Xytronic LF-853D Multi function rework system. Soldering, Desoldering and Hot air system. 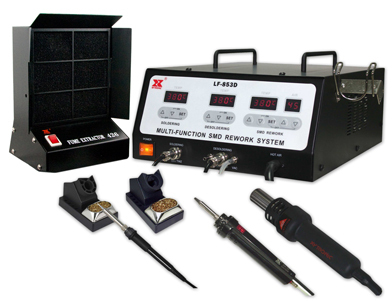 Specializing in lead free soldering/desoldering and surface mount devices with temperature controlled hot air. Tools can be used simultaneously. • Heater/Sensor Failed Detection: If the sensor circuit fails, the heater power is shut down. • Energy Saver Mode: If the stations is left idle for 20 minutes, the energy saver feature will automatically engage, resetting the temperature to 150 deg. celsius from the previous setting. • Temperature "Lock-Out" Feature: The temperature can be locked with a password code. • ESD Safe and Spike Free Circuitry: The "Zero Voltage" electronic switching design protects voltage and current sensitive components (CMOS devices, etc) against damaging current and transient voltage spikes commonly produced by less efficient, mechanically switched stations. • Delayed Suction: To eliminate the problem of solder clogging up the tip, a delayed switch feature has been incorporated for the unit that allows the pump to continue sucking for 1.5 seconds after the actuator switch is released.